PDF page splitter merger application break divide large file into multiple smaller parts and combine add multiple smaller PDF file and create a big file. Pdf merger splitter software joins multiple pdf files to make combined documents, easy to send fax at once. 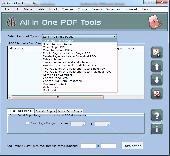 Splitter part pdf pages into several smaller files, extract specific pages into new pdf file, removes unwanted pages from bulk pdf.